When it comes to NOSQL databases, one of the key advantages is that they allow you to structure your data in a way that better resembles your domain, and also allows you to use query languages where you can express things that are either really awkward or slow with SQL. 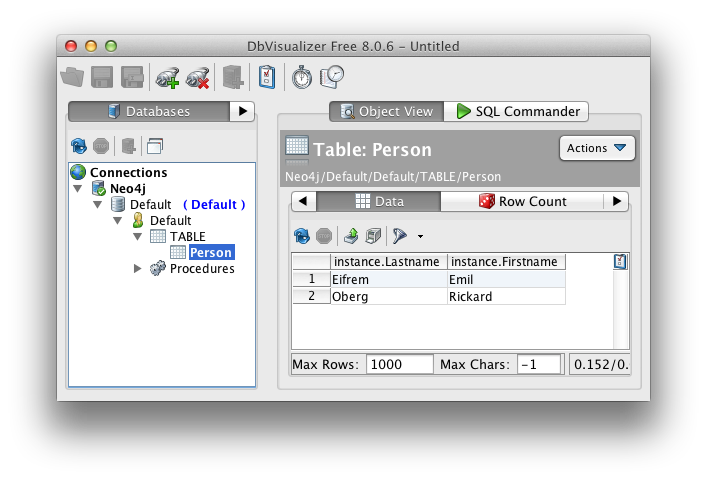 However, one of the advantages that relational databases have is that they can be accessed from lots of tools using JDBC, as a standard API. 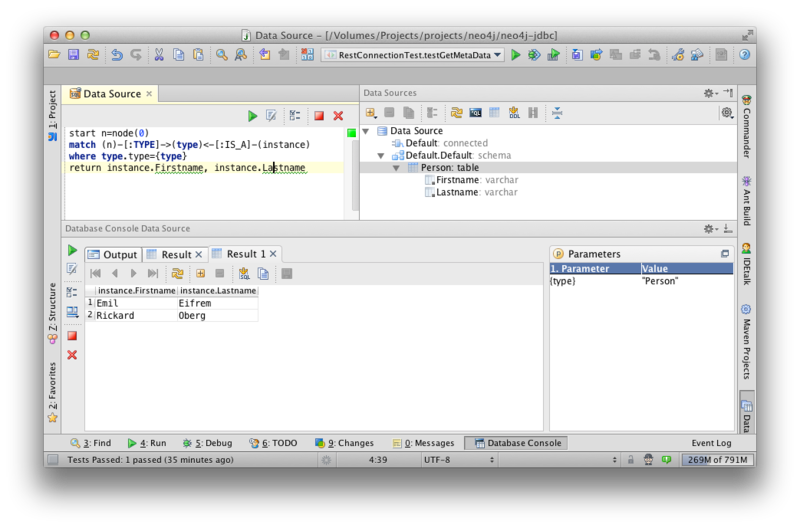 So what would happen if a NOSQL database, like Neo4j, also had a JDBC driver? I decided to find out! Neo4j has a REST API that allows distributed access, and a query language called Cypher which can be used for ad-hoc queries. Since the result of such queries are iterables of maps with key-values, they can be reasonably easily converted to the JDBC ResultSet concept. 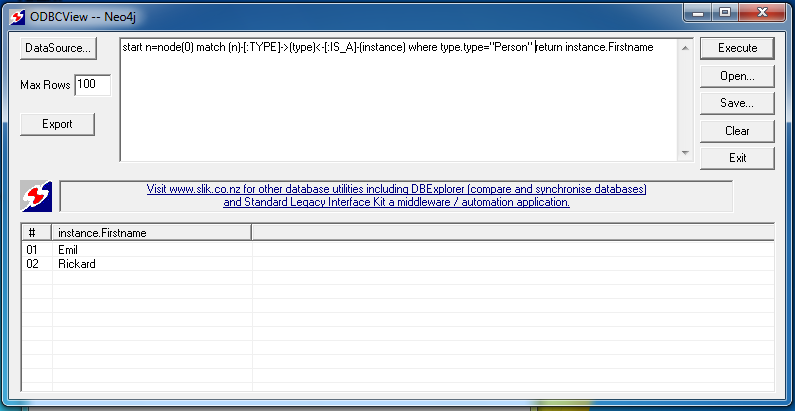 So I created a thin JDBC API implementation using the Restlet framefork that delegates to this REST API, and sends query strings to the Cypher endpoint. The JSON requests and responses were handled using the Jackson JSON library. Notice that the above creates a parameterized query and also supplies it with the concrete parameter, so that the result can be easily executed. While the JDBC driver can be used as-is to execute ad-hoc Cypher queries, to be usable from normal SQL-aware tools there is a little more work required. 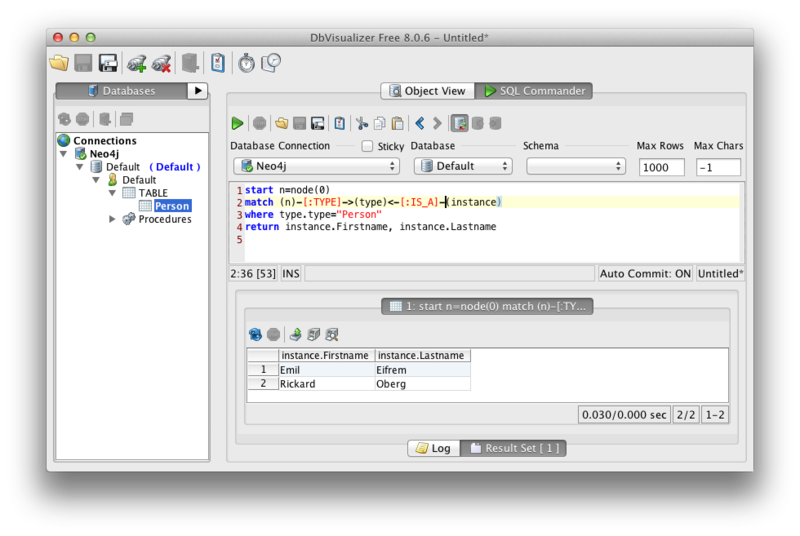 Specifically, most of these tools will send standardized SQL requests to get data, such as “SELECT * FROM Person”, which will not work with this JDBC driver, as there is no SQL support. What I did here is to create a “quirks mode” which recognizes these calls and converts them into the Cypher equivalents. By doing this I managed to get the tools outlined below to work. This means that if you want to try a tool not explicitly listed below the discovery part of the tool probably won’t work properly, whereas sending query strings and viewing results should work. Please send me a note if you have a tool that you would want to have supported! At the moment the driver only supports reads, since Cypher, as the underlying query language only supports read operations. Once Cypher has been updated with support for modifying operations it should be possible to add this to the JDBC driver. If/when Neo4j gets a binary connection protocol, it will be interesting to try and support that instead of the REST API. That should allow for higher performance, both due to serialization efficiency and connection management. 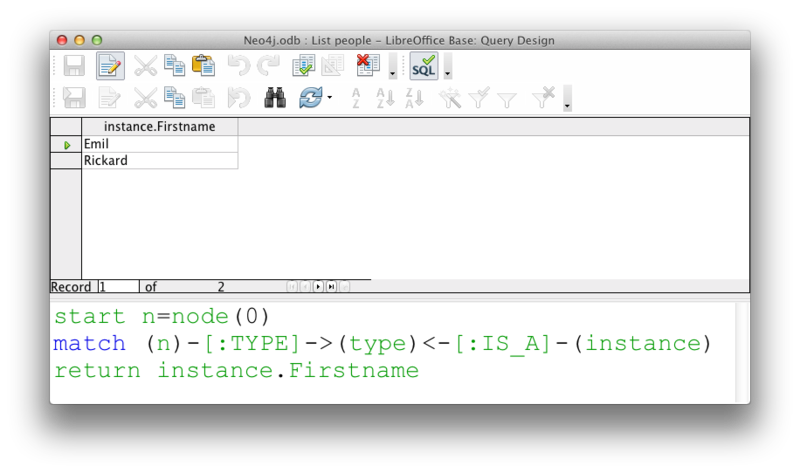 While most NOSQL databases, such as Neo4j, provide a non-relational way to store and query data, in this case it was possible to create a JDBC driver that can expose that non-relational data in a way that works reasonably well with the JDBC API. This makes it possible to access Neo4j from a whole host of tools, and makes it possible to more easily make reports from its data, as well as debug the data itself. For more details, see the GitHub project page to download and install the driver. If you want to get started quickly you can download the test database that I created for the above screenshots from here.